As the hearing in the petitions seeking an independent probe into the death of special CBI judge Loya resumed on Monday before the Supreme Court bench of Chief Justice Dipak Misra, Justice DY Chandrachud and Justice AM Khanwilkar, senior counsel Mukul Rohatgi, appearing on behalf of the State of Maharashtra, recapitulated his arguments advanced at the previous hearing regarding the maintainability of PILs and laches of over 3 years in filing of the present petitions. He also reiterated the sequence of events leading to the death by heart attack of judge Loya, adding, “Attempts at resuscitation were made at Meditrina Hospital upon which judge Loya was pronounced as having been brought dead. The post mortem was directed as he had not died under the care of the hospital. Four judicial officers have confirmed this by a letter on their own letterheads, and in one case, in his own hand. These are letters written of their own accord and not in an interrogation. The high court judges who reached the hospital around 7 AM on the date of the death have also affirmed the same. The post mortem was conducted at 10 AM at a government hospital, after which the body was sent to judge Loya’s hometown. It is all contemporaneous”. “The article in The Caravan is false and baseless. It was written 3 years after the death in November last year. And this is because a month or two before, the Supreme Court had dismissed the challenge to the discharge of a particular individual (BJP President Amit Shah). It is a motivated article,” Rohatgi submitted. Referring to the death report of Police Station Sitabardi, he offered justification on the claims of the petitioners regarding the erroneous noting of the date: “The ‘ghatna tareekh’ in the original was recorded as November 30, 2014, but by 4 AM, it was December 1, 2014. The nakal bayan bears the correct date of December 1, 2014. It was signed in English by Dr. Prashant Rathi at 8:30 AM on that date”. “There is another death report at PS Sadar as the Ravi Bhawan is located within its jurisdiction. The name of the ‘faryadi’ is shown as Dr. Prashant Bajrang Rathi. The ‘ghatna sthal’ is noted as Ravi Bhawan, and the date as 4 AM on December 1, 2014 for the ‘ghatna’ and 6:15 AM on the same date for the death. The nakal bayan at Sadar was recorded at 4 PM on December 1, 2014. There was only a transmission of files from Sitabardi to Sadar and a duplication,” he continued. “The first Accidental Death Report was at Sitabardi. On the basis of the information communicated by the Constable of that police station, the record at Sadar was made,” concurred Justice Chandrachud. Thereupon, he discussed the preliminary opinion as to the cause of death of the Department of Forensic Science, Government College, Nagpur. The bench requested to peruse the aforesaid document. Senior counsel Dushyant Dave, appearing for the Bombay Lawyers’ Association, requested to see it too, which Rohatgi refused. When Dave regarded it as a “self concocted evidence”, Rohatgi advanced that it is of no relevance. Senior counsel Indira Jaising also interjected, “He cannot unilaterally decide relevance. We have already asked for the police diary”. Chief Justice Misra intervened to say, “Once a document is produced before the court, it needs to be shown to the opposite side, unless it is privileged communication”. Finally, Rohatgi agreed to share the document. Regarding the disputed question of the conduct of ECG, Justice Chandrachud remarked, “Judge R Rathi stated that the ECG machine was broken”. “Judge Barde and Dr Dande have confirmed that an ECG was carried out at the Dande Hospital. Judge R Rathi has also not said that there was no ECG machine; he has only said that the ECG machine was tried to be fixed. Perhaps only some nodules were connected that picked some impulse ... Judges are laymen in medicine and probably could not tell”, responded Rohatgi, adding, “This is not a murder appeal. I am only showing for the sake of the conscience of the court that this is what happened”. “If judge Rathi is a layman, then so is judge Barde. Judge Barde only said judge Loya was checked through ECG, and judge Rathi said the ECG was tried to be fixed but could not. Even judge Barde does not say that the ECG was done,” interjected Jaising. Thereupon, Rohatgi referred to the statements of the wife and father of judge Loya. 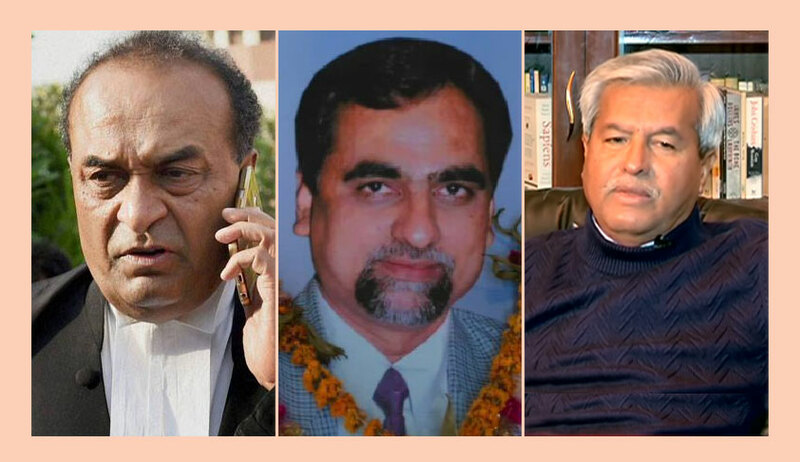 He drew the attention of the bench to portion where judge Loya’s widow stated that she had last spoken to him around 11:30 PM on November 30, 2014, received a call from judge Modak at 5 AM the following day and, thereafter, by several judges, after which all family members agreed to proceed to judge Loya’s hometown near Latur. Regarding the allegations in The Caravan article on the involvement of RSS worker Ishwar Baheti, Rohatgi advanced that the police has confirmed there are three persons by the name of Ishwar Baheti at Latur, out of which one was a relative of judge Loya. Finally, relying on the report of the Commissioner of State Intelligence of Maharashtra, he submitted, “The Caravan article says judge Loya was carried to Dande in an auto rickshaw. But the report states that he was taken in judge Barde’s car, which has also been confirmed by judge Barde ... the article also alleged that judge Loya’s body was sent to his hometown unaccompanied, whereas two local magistrates of Nagpur had accompanied the body ... the article has claimed that there were blood stains on the body, which has been refuted by the post mortem report”. “The state has no doubt in the statements of the judicial officers or the inquiry conducted by the state intelligence. Judge Loya died a natural death. There is nothing suspicious about it”, advanced Rohatgi. In support of the above submission, he referred to the judgment in State of Maharashtra v. Mohammad Salim Khan [(1991) 1 SCC 550]. He also relied on the Bombay Police Manual (Volume 3) in so far as it deals with inquiries into accidental deaths. Rohatgi also drew the attention of the bench to the admission in the government hospital for post mortem, where also judge Loya was misnamed as ‘Brijmohan’; the bill of Meditrina Hospital; the forensic report of February, 2015; and the closure report. Concluding his arguments, he sought to file reply on behalf of the state of Maharashtra to the Bombay Lawyers’ Association’s application under Order 11 of the Supreme Court Rules for cross examination of the four judicial officers. “I have assisted this court in the PIL against Atal Bihari Vajpayee ... I have also assisted this court on the plea regarding admission of narco analysis and lie detector tests to accused persons ... there is no political motivation in the present matter as is being alleged ... four judges of this court have also expressed reservations about the Loya case,” he continued. “We are not taking note of the said notice. You can argue,” responded the Chief Justice. “You are bringing facts to our notice. Like the ground regarding non compliance with Section 174 of the CrPC. We are proceeding so carefully so as to see within our conscience if an inquiry needs to be directed ... Many things may be said outside of this court ... but nobody can stop any member of the Bar from arguing before this court,” added Justice Chandrachud. “The manner in which this matter is proceeding is not satisfactory. The matter cannot be thrown out at this stage ... the pleadings need to be complete, otherwise, how will I controvert? The Supreme Court Rules require all statements to be on affidavit ... a mere report cannot be taken on record ... I am not sure why the court is reluctant to issue notice to the state to file affidavit. The court cannot allow these documents to be exchanged across the bar. These four judicial officers must be asked to come on affidavit. If they refuse, then there is a problem,” Dave continued. “There is no such rule ... a petition maybe dismissed ex parte or after hearing both parties if there is a caveat or after the court perused the records ... Ms. Jaising showed the Ravi Bhawan register; I showed the photocopy, I can also show the original,” intervened Rohatgi. “How can the state file affidavit,” inquired Justice Khanwilkar. “Then the state must not cite the report. The letter by judge R Rathi was written on November 23, 2017, itself, the date on which the discreet inquiry began; the others are dated November 24, 2017. Just take a look at the dates,” exclaimed Mr. Dave. “That can be a ground. But affidavits do not improve cases,” observed the Chief Justice. Quoting further from the 1991 judgment, Dave read, “In order to enable the court to find out the truth and render a just decision, the salutary provisions of (Section 311 of CrPC) are enacted where-under any court by exercising its discretionary authority at any stage of inquiry, trial or other proceeding can summon any person as a witness or examine any person in attendance though not summoned as a witness or recall or re-examine any person in attendance though not summoned as a witness or recall and re-examine any person already examined who are expected to be able to throw light upon the matter in dispute; because if judgments happen to be rendered on inchoate, inconclusive and speculative presentation of facts, the ends of justice would be defeated”. Further, he cited the 2008 judgment in CIDCO v. Dosu Aardeshir Bhiwandiwala, in so far as it was observed therein, “We are constrained to confess the case has left us perplexed. The stance adopted by the State of Maharashtra and the District Collector is stranger than fiction. It is difficult to discern as to why they remained silent spectators without effectively participating in the proceedings before the Court. No explanation is forth coming as to why they have chosen not to file their replies to the writ petition in the high court ... It is the constitutional obligation and duty of the State to place true and relevant facts by filing proper affidavits enabling the court to discharge its constitutional duties ...”, emphasising on the paragraph wherein the apex court ruled, “The State in the present case instead of filing its affidavit through higher officers of the government utilised the lower ones to make oral statements ... this malady requires immediate remedy”. Continuing, Dave submitted, “Bombay Lawyers Association is a registered body under the Societies Registration Act...What more do I do to prove about my bonafide?” “The locus and bonafide are not being questioned”, assured the Chief Justice. Responding to the state’s repeated claims on inaction for over 3 years after the death, he advanced, “What did the state do for 3 years? A member of the lower judiciary was not provided security ... if at all he died of a heart attack, no proper treatment was administered to him ... there was a lack of post death support for his funeral and his family ... no independent inquiry was initiated into his death”. Moving on to discuss the law on PIL, he cited the judgment in SP Gupta (1981), wherein it was observed, “It may therefore now be taken as well established that where a legal wrong or a legal injury is caused to a person or to a determinate class of persons by reason of violation of any constitutional or legal right or any burden is imposed in contravention of any constitutional or legal provision or without authority of law or any such legal wrong or legal injury or illegal burden is threatened and such person or determinate class of persons is by reason of poverty, helplessness or disability or socially or economically disadvantaged position, unable to approach the Court for relief, any member of the public can maintain an application for an appropriate direction, order or writ in the High Court under Article 226 and in case of breach of any fundamental right of such person or determinate class of persons, in this Court under Article 32 seeking judicial redress for the legal wrong or injury caused to such person or determinate class of persons”. At this point, the bench arose for the day, scheduling the matter for further hearing on March 5.